Celebrating the Chinese New Year also means powering up your energies. What better way to soar and see things from the heights than riding the Sky Ranch’s zip lines? Going up and down the Ferris Wheel gets an entirely different meaning if you do it during the Chinese New Year – think of it as your own personal encounter with the Wheel of Fortune that opens doors of opportunities for you. The Loop Roller Coaster takes you on a dazzling journey that makes you see new vistas, heralding the chance for you to acquire a new, lifechanging mindset. Store up your spirits and recharge by indulging in your favorite food fests. Sky Ranch also featured restaurants such as Uncle Cheffy’s Kenny Roger’s Roasters, Leslie’s and Tokyo Tokyo that offer various gastronomic delights to visitors. Those who want to try their food palate on a wide variety of cuisines as possible have numerous choices from the Fiilpino-themed Mesa, the homegrown Downtown Pizza, quick but tasty meat-and-fish fixes in Red Engine Diner, and beer fests in The Rou Bourbon Restaurant and Bar. Guests can feast on their food while taking in the view of the picturesque Taal Volcano. 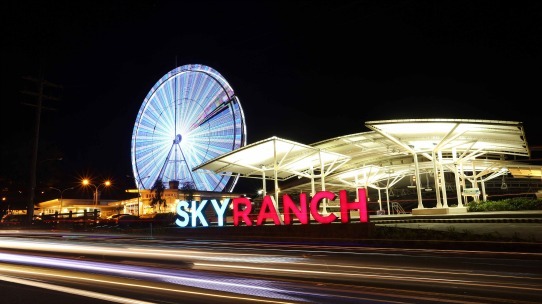 The Sky Ranch is among the most popular to-go places in Tagaytay which is open Monday to Sunday, from 8 AM to 10 PM. The SM-owned park has earned numerous recognition for its “sulit” and fun adventure, and is near notable spots in the area such as the Picnic Grove and People’s Park.